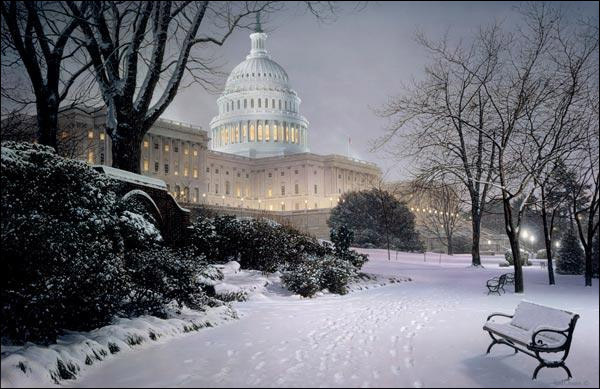 Inspired by the distinct lighting on the Capitol and the pure serenity of the snowy pathway, artist Rod Chase focused his talents on creating Evening on the Hill — an elegant, truly amazing, painting of our Capitol. An integral piece in the Foundations of Freedom series, Evening on the Hill is both unerringly realand poignantly beautiful. Chase was particularly attracted to this snowy scene because of the unusual lighting of the structure and the pure serenity of the pathway leading to it. Unsure of the type of shadow cast by a park bench, Debbie, Rod�s wife, purchased a bench from an antique store, and they set up lighting that approximated the light source in the painting. The artist is a down-to-earth gentleman with a quick wit and lots of common sense. He is also the ultimate perfectionist! Evening on the Hill is the sixth painting in Rod Chase's Foundations of Freedom series. Evening on the Hill copyright© 2004 by Rod Chase is prohibited from being copied. 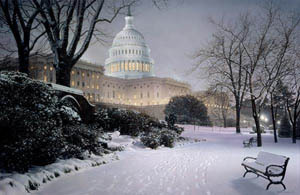 Rod Chase art, Foundations of Freedom series, Capitol building, winter, snow, Washington DC, historical landmarks, patriotic, Americana, artwork, art work, canvases, images, paintings, pictures, and prints of Evening on the Hill by artist Rod Chase for sale. Evening on the Hill painting by artist Rod Chase can be purchased in art print or canvas form at special sale prices at Christ-Centered Art.